When you invite someone you love over to dinner, it is only fair to try and accommodate their dietary needs and choices, yes? Well, I happen to love intrepid musician and vegan, Lipbone Redding, and preparing him delicious food is one of my favorite ways to show him how much I care about him. He is also a spectacular cook who keeps me fed with healthy, amazing meals all the time, so I decided to take my turn in the kitchen. This Thanksgiving, I took on the challenge to create a feast fit for all the various omnivorous preferences of my family and friends, and I think I came up with some truly delicious and surprising vegan twists on traditional foods that, in my opinion, were better than anything I’ve made before, (delicious) animal products aside. I’d like to share with you all the new recipes I’ve developed! Spiral cut ham prepared by my friend Kari for the carnivores. This recipe needs to be made at 24-48 hours prior to serving, as the collards are primarily “cooked” by the acid of the vinaigrette while refrigerating over-night. Two large bunches of fresh collard greens will make a LOT of cooked collards. I was serving 9 and intended to have left overs. 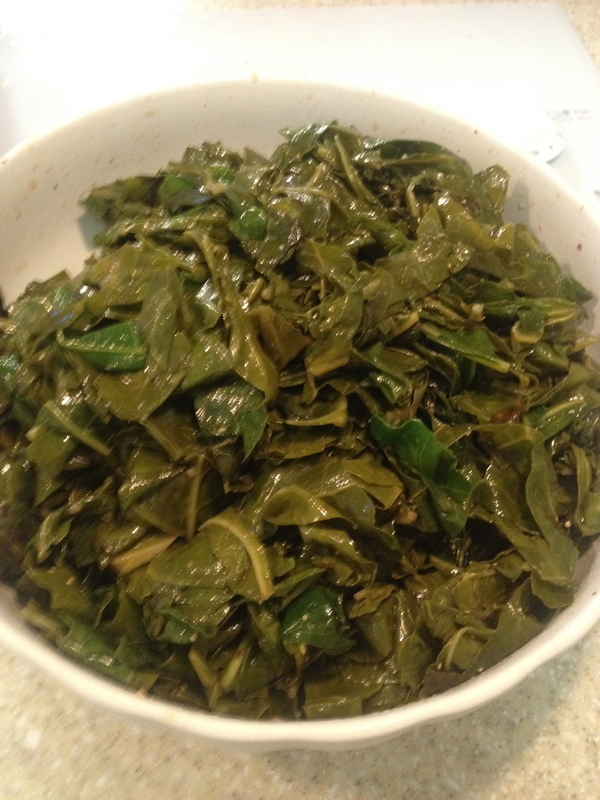 Begin by washing the collard leaves thoroughly in a sink full of warm water and a healthy splash of white vinegar. Allow to mostly dry. Fold leaf in half along the thick spine, and cut the tough spine and stem away, discard. Stack three such leaves on top of each other, roll tightly and slice into thin ribbons, set aside in the largest mixing bowl you have, because there is going to be a lot of fresh leaves! After all leaves are prepared, heat a large wok, or frying pan, or in my case, an electric skillet, to medium high heat, and add about 1 tablespoon of Olive Oil, though I will admit that I just pour some into the pan without usually measuring. Add one pan worth of the greens, and with a pair of tongs, saute them, stirring constantly for about 3 minutes, then put a lid on the pan, and let steam for about 3 minutes more. 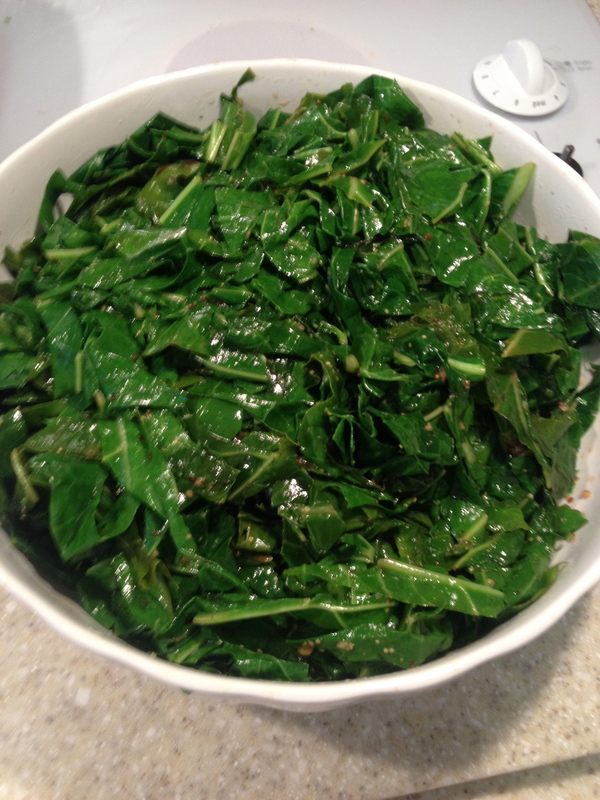 Remove the cooked greens to a large, clean bowl. Repeat the process with another splash of olive oil, until all the greens are cooked and in the bowl. It took me 6 batches, so 6 splashes of Olive oil, to cook them all. Stir all the batches together and allow to cool. 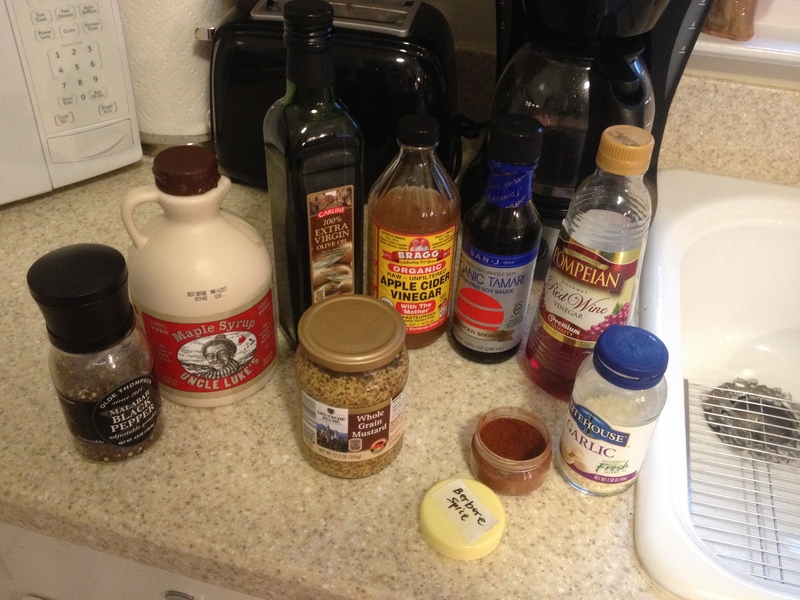 I prepare the vinaigrette in a large, glass measuring cup, by adding all the remaining ingredients, then blending with a hand immersion blender, or you can add them all to a traditional blender, and puree them together. Pour about half the vinaigrette mixture over the greens, tossing to thoroughly spread the vinaigrette throughout. Cover the greens tightly and refrigerate for at least 24 hours. 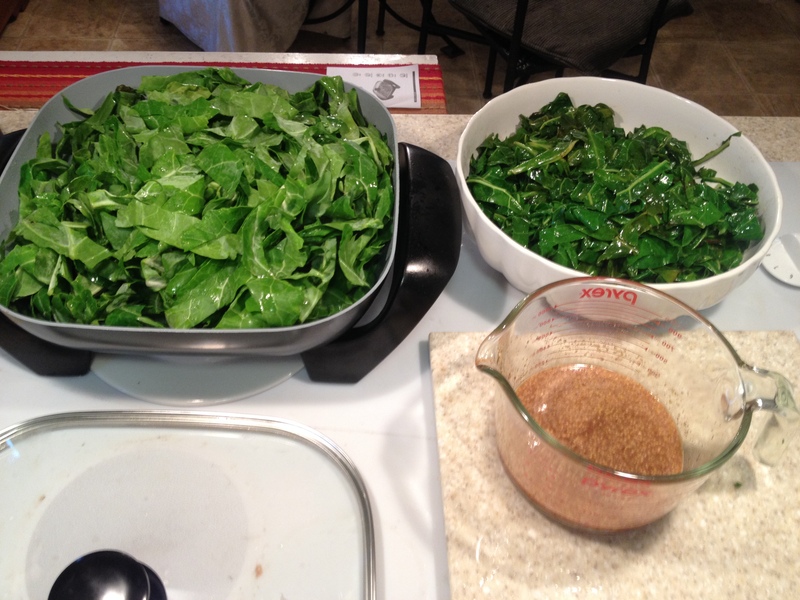 Occasionally, take them out and stir them up to redistribute the vinaigrette throughout the greens. The acid in the vinegars will continue to “cook” the greens, and the next day you will find that their color has deepened. This actually protects the vital nutrients, while allowing them to become more digestible. Prior to serving, I place them in a large saute pan over low heat, and allow them to warm on the stove, or in a crock pot over low. I pour the remaining vinaigrette mixture into a bottle with pour-spout and serve that with the greens, so people can add more as they desire. Test for taste and add more sea salt or black pepper to suit your tastes.